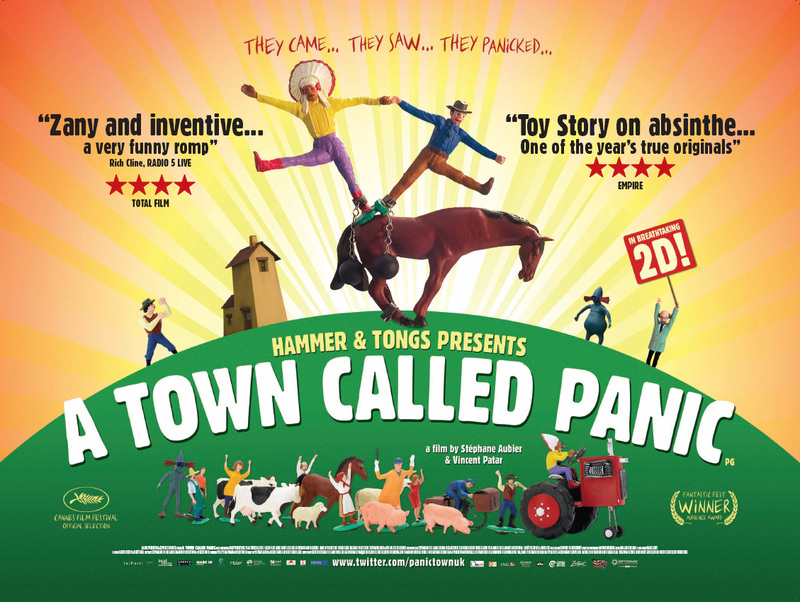 A Town Called Panic is an anarchic comedy from Belgian animators Vincent Patar and Stéphane Aubier. The film centers on Cowboy, Indian and Horse and their many adventures. A Town Called Panic is incredibly funny and unique and the off kilter humour feels both original and inventive. In order to help the film find its audience in the UK Optimum have enlisted Garth Jennings and Nick Goldsmith (AKA Hammer & Tongs). Responsible for a wide range of advertisments and music videos (probably most famously the video for Blur’s Coffee & TV) the pair were also the brains behind the 2005 version of The Hitchhiker’s Guide to the Galaxy and Son of Rambow in 2007. The pair were kind enough to give us some time to talk about A Town Called Panic and their own projects on their wonderful office on a barge. How did you become involved in helping to promote A Town Called Panic? Son of Rambow was distributed by Optimum in the UK and they were great, we really liked them. When they came to thinking about releasing A Town Called Panic they called us up to see if we’d be interested in coming on board to help with it. It was a bit weird to start with, thinking we haven’t made it. It’s an odd thing to come into someone else’s film you haven’t made. But then we watched it and instantly wanted to help in any way we could because we absolutely loved it. We’ve loved their stuff prior to it and have seen all sorts of bits. We used to send clips to each other. It sort of feels like you want to help them and it’s interesting coming on board late rather than early, with a ‘Presents’ credit to help raise the finance or something. It can sometimes be a cynical thing seeing a ‘Someone Presents’ and that would have been our only reservation but after watching the film it was simply a matter of how can we help because people should see this film, because it’s bonkers. There’s not enough bonkers films out there and the nice thing is that Optimum have let us get involved in coming up with ideas to help market and promote the film and that’s been quite fun as well. Like on the poster it says “In Amazing 2D” and one of things we said was it’d be great to make some 2D glasses so that people don’t feel left out because they’re not seeing a 3D film. We can go half way to giving them that experience so that they can feel like they’re getting their money’s worth. They’ve made those and they’r distributing those. Also there’s an ambition to the film, they’ve gone for it, they’ve made a feature film out of plastic figurines and the story itself has so much ambition. It’s not the kind of film where you’d want to do some covert, simple, nice, very cool thing. You want to drive a tractor, you want to have the megaphone on top of the car. If you could afford it you’d want to have the helicopter fly over with the giant banner behind it. It’s the sort of film you’d want to drop a horse out of a plane. Is there anything you wish you could have done to promote your films? When we come to our next film we’ll take more of what we learnt from A Town Called Panic into the next film in terms of how we could push and drive the marketing rather than just approving of someone else’s ideas. What appeals to you about the way A Town Called Panic was made? The way they deal with their creative limitations. The inventive way they animate is very endearing and very funny. There are so many jokes that come from the way they’ve solved a problem for one of their characters. The way that someone would walk or get down some steps or just sit down and cross their legs. There’s some big laugh out loud gags just in the way they’ve been inventive. That’s certainly a big part of its appeal. It’s something so unique and lovely. You should really try and help to get as many people to see it as possible. Both your films and A Town Called Panic have a sense of a previous time and Son of Rambow and A Town Called Panic both recapture that feeling of being young and playing. None of them fall into an overly nostalgic area though. How do you avoid this? It’s not about being old-fashioned and cool and retro. It’s about making things engaging and that can sometimes be simple. It can look like you’re being nostalgic but actually all you are doing is making something engaging again. I don’t think there was a conscious decision in Hitchhiker’s, we went into it making what we wanted to make. We weren’t trying to be nostalgic, it was just the way we wanted to make it. We wanted to do it with puppets because it’s brilliant and you get to play with puppets. Son of Rambow was set in the eighties, we didn’t want to make an eighties film but it was the time that we were growing up and it happened. It wasn’t a conscious decision about doing a nostalgic thing. I can’t speak for Vincent and Stéphane but I’m assuming it’s a similiar thing. They liked playing with these animated characters. I don’t think they’re trying to be old fashioned are they. If anything, when you see something like Open Season 3 or whatever it looks a bit old fashioned, that CG thing. It’s fine for commercials or something. Then you see something like A Town Called Panic and it’s so inventive it looks like something new again. It’s a playfulness and inventiveness that I suppose is associated with being a kid, not really worrying too much about it. We want to make films that we like and I think maybe we are quite childlike at times and so it comes across that way. It’s not an intentional thing though, it’s not a decision that we should be doing this. We just end up making that. It’s always about capturing a sense of wonder and engaging with an audience. We’re always trying to think of ways to do that. It invariably relies on going back to something fairly simple, not necessarily that big. Although we’re always big fans of blowing things up. The next thing for us is a Hammer & Tongs DVD that is coming out in November I think. That’s a collection of all our music videos and we made this home movie documentary and stuff like that. It’s taken us quite some time to put together, it’s always more tricky than you’d think. Then film wise we’re hoping our next film will be an animated film. We’ve started early test and concept work on that. It’s early days, early concept. We’re getting close to getting that off the ground now. A Town Called Panic is released in the UK on the 8th of October. Check out the UK trailer here.